The last Sunday Worship of Fall semester was on December 16th, 2018; we will resume our gathering on Sunday, January 13th, 2019 with a Love Feast Potluck. Merry Christmas! Life brings changes. At Pres House, Sunday worship to is shaped in our changes. We try new things. 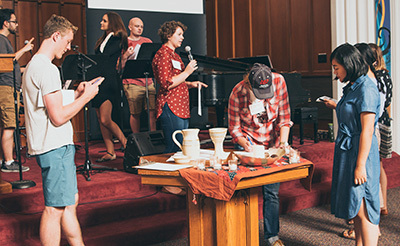 We craft a space for worship not simply by a tradition or a set way of “doing church,” but by the people who form our gathering. Together we ask, what is real? What is important? Who was Jesus? How should we live our lives? We are met in our questions with an invitation to engage ourselves and an opportunity to grow. Sunday worship at Pres House includes music (a mixture of traditional hymns and contemporary praise music), scripture readings, a sermon, prayer, communion, eating together, and other creative elements. Worship of God requires something from each of us; we are not passive recipients at a lecture or show, we have come to worship God!